Discuss your round six moves. The Chosen One has now lost every game for the season and actually dropped below the team that has not updated since round 1. Sitting comfortably at 17/18. Just goes to show you shouldn’t listen to spuds like him who criticise teams all preseason. The guys a joke. Even scored a donut with no bench cover. Is Deledio an option or pay up for Mclean/Gray/Menegola/Ziebell? Go with Gray imo, saves a trade in future. If you get lids now most likely you’ll look to trade him to a top fwd towards the end of the season. Finlayson > Seedsman or Rioli > Guelfi and play Guelfi on field for waterman. Get rid of Waterman, he’s more or less peaked. who will average more – Menegola or Gray or Mclean? who is a better pick? Yo peeps. Long time no see. Shags from Japan. 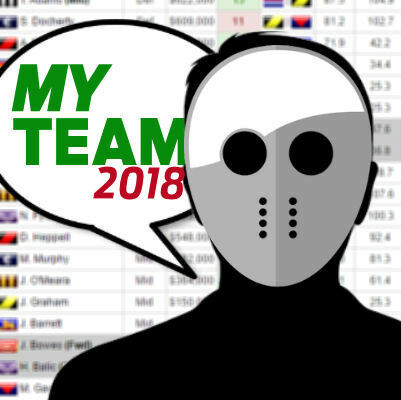 Actually my first team post for the year. Trade Fritz to McInerty and get English on field fwd. Kelly > zerret, although can get almost any premo. Or, I could trade non playing Crowden to Zerrett instead. seedsman and mclean should be top 6 in their positions, id say their your best bet. Got a fair bit of cash to spend so any ideas of what trades to make would be MUCH appreciated. Id be looking at fixing your bench. Landon is back in but Fogarty/O’connor/Venebles aren’t doing anything for you. Field Brayshaw Banfield or Barry? Who should I bring in for Christensen to play at F6 out of Guelfi, ZGL or McInerney (play English at F6)? Currently have Waterman and Esava on the pine. i would say bringing in mclnerny is a good idea this week, and bringing english to f6. will give the most $$, and looks safest. really stuck this week boys. thinking option 1 or 2, but feel brayshaw still has money to make. waterman however is done, and has just about reached his peak. i like the look of witherden, should push top 8 defenders by the year’s end, especially with not many other decent options. if dylan clarke is named, id get him instead of worpel. would love to see the back of parker, has been nothing but a headache this year. 2nd option fixes some of your problems. What’s everyones thoughts on Sam Jacobs? will he avg 95+? Yea mate so have I, although i’m seriously considering trading him down to McInerney and playing English R2 because he just seems to as you say plod along. Nothing special nothing woeful. Currently gone Fritsch/Waterman (pending selections) -> Guelfi and Brayshaw -> Zerrett. I think I’m pretty set on bringing in Guelfi, a rook who can score and has good JS is worth his weight in gold, especially as a FWD. So for my second trade do I get Zerrett and strengthen the mids (10k left), or do I double down and bring in Frampton and play English at F6 (443k for next week). Torn. Get cogs in now, going perhaps a week early on Holman and $100k left over. Or go Taranto & $274k? Hey guys, got a few spots left in this league. Feel free to join! Is it just me or are three of the four interesting games this round on Sunday? (the other one being Geelong vs Sydney) Fixturing problems 101.